The online world may have attracted young ones at first, but today the Internet is frequented by people of all ages. Online gaming, for instance, draws millions of seniors – especially women - to their entertainment sites each day. Social media sites are also becoming more popular with senior citizens, as well as numerous “just for seniors” forums and chat rooms. If you’re interested in becoming a part of the online senior community, here are five ideas to get you started. If you take advantage of ClearCare’s homecare system, navigating the online world with your caregiver will be much easier. Not only does Flickr showcase some of the world’s most fascinating pictures, it’s also one of the best online photo management systems. Just like ClearCare’s homecare system, Flickr allows you and your family access to an online portal. You can share photos and videos with anyone, anywhere. Flickr is home to more than 5 billion photos, so you’ll never run out of interesting images to view. If you’re taking advantage of ClearCare’s homecare system and homecare software, your caregiver can keep track of your log-ins and passwords, as well as the links to your favorite sites. • Caregiver services – make sure you check out ClearCare’s homecare system! To keep up-to-date with news and entertainment relevant to seniors, ask your caregiver to bookmark this site using her homecare software from ClearCare. 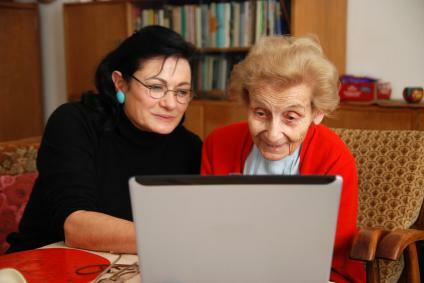 Using the internet for fun and entertainment is an excellent way for seniors to stay mentally active and engaged. It wards off depression and can even promote better overall health. Caregivers should always utilize ClearCare’s homecare software to note what online activities their senior clients enjoy, and make it a point to offer assistance whenever necessary.